The Sochi Winter Olympics is coming soon. So I thought of something that I used to do in Primary Singing Time during the Olympics that is always fun. Olympic Ribbon Sticks for twirling to music! Olympic Ribbon Twirling…we can do some of that in Primary Singing Time! HERE at Oriental Trading is the set I bought to use for music time and in my classroom. I used it at end of the year musical too to add some pizzaz! Kids love twirling the ribbons to music like they do in the Olympics. But you can make your own twirlers too. Make up some ribbons on individual chop sticks and pass them out to 5 or 7 kids in your Primary. They can stand in place and whip the ribbons around to the beat of the song you are singing like they are doing the Gymnastic Artistic Ribbon Dancing. I just taped the ribbons on to some wooden skewers I had gotten from the Dollar Store. Or you could use chopsticks. You’d only need 3 pairs. I bet Pei Wei or Panda would give them to you FREE! My hubs always says, “That’s stupid, it’s not even a sport, Look Ma, I got a gold medal in ribbon waving! !” lol. He makes me laugh all day long. This is ribbon I had on hand. You could use curling ribbon or craft ribbons of any kind. Here’s how mine look. I think I made them about 3 feet long with ribbon. Use up all your leftover ribbons from packages. Glue gun the end of the ribbon to the pointy tip of the chopstick. 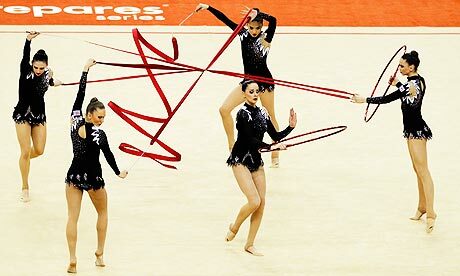 These are the REAL ribbons for gymnasts…..but we could do them in rainbow colors! Then make up a list of songs on the board and choose kids to come up and get a chopstick and choose a song. Then they can pass out the rest to their friends and have them all stand up and wave like crazy while the rest of the group sing their hearts out. them out of crepe paper but they wouldn’t last but a day. Link HERE to see. Hey, I thought it was really fun! Kids will too!